We had to find another way. It was decided we would release a self-penned song as our next single. This was 'Time To Rock'. All four of us have a writing credit on this single. CBS was the favoured label again. We chose to rehearse this song at Highbury Studios, Swann Yard, Islington. The reason behind this decision was the studio had an upright grand piano. This was Curly Clayton's studio, whom we knew very well. He was a great musician and character. 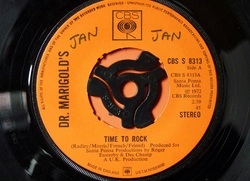 'Time To Rock' was recorded at Audio International studios in London. This was a studio well known to us. There was talk that it cost about £40 an hour to use the studio. That was without the expertise of the engineer. This was in 1972. A tidy sum. Again I thought we achieved a really good sound. We were handed a song called 'Tokens' to put on the B side. Now, we didn't know what 'Tokens' was about. It was muted that the words could be about drugs ie: Toke. Who knows? The opening line in the song is "Sitting Getting Higher, In The Back Of A Limousine." Have to make our own minds up. Dave & Fred unloading van at the Robert Peel, Kingston, Surrey. We were still getting lots of live gigs but the fees were standing still. We opened for Screaming Lord Sutch twice, once at Gravesend Civic Centre and the best gig, at The Marquee in London. I thought he was without doubt the best frontman I ever saw. The Marquee gig was in November 1972. I can tell anyone, opening at The Marquee was a daunting task. The audience do not avert their eyes from the stage. I was told that some Mott The Hoople band members were sitting in the front row. 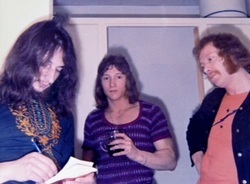 Although we could be classed as a pop group, at this time we were writing more songs leaning towards the style of Roger Chapman's band FAMILY. These songs gradually took preference in our live set. I was really looking forward to seeing Lord Sutch, he had a reputation of using great guitarists, Ritchie Blackmore probably the best known. I wasn't disappointed with The Lord. As usual he was inside the coffin being carried by other group members, just as pallbearers. The lighting was ghoulish, great guitar riffs were wailing, moaning and groaning from inside the coffin. A sight to behold. If we didn't know this was The Lord's act, it could be said, he was a suitable case for treatment. His props were piled high at the back of the stage. He just ran riot, all around the stage, into the audience, out into the foyer, all whilst Rock Music was being played. A really great show. The bonus was, he could sing Rock and Roll. I can state, that night at The Marquee I almost met Jack The Ripper. Axes and blunt instruments ruled. Publicity shot at Marble Arch, London. Despite Radio 1 airings again 'Time To Rock' hit rock bottom. We now had plans to record our second album and another single, this time on a new label owned by Roger Easterby. This was the Santa Ponsa label. The plan was to use Audio International studios again. 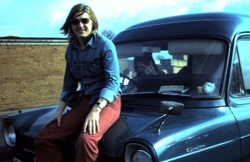 Roadie Dickie Barrowclough (RIP) who lived on the Copenhagen Estate. We hired a detached bungalow in Blean, a small village in Kent, near Canterbury. We planned to stay for a week and rehearse the songs for the new album. With no distractions things went well. To soundproof the building we put the heavy cushions up at the windows. After a week of sunbathing and rehearsing we were ready for the studio. Among the songs we learned was our new single. This was a nice song written by T. Wilson, better know as Errol Brown's songwriting partner, both members of Hot Chocolate.